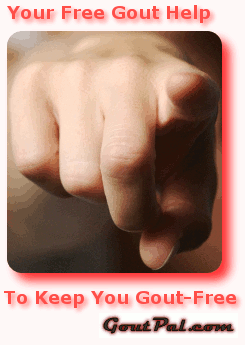 Gout and you is a series of connections between gout and something gout sufferers worry about. That something might be a food item, a symptom, a treatment, or something else. Based on what people are looking for when they visit GoutPal, these are the top 100 topics that people associate with gout. The results are biased by the topics I have written about, so do not worry if your particular concern is not listed. If my list does not include a topic that interests or concerns you, then please ask in the gout forum. You might notice that I often advise you not to be concerned about many specific items. This is usually because there is no known connection. Often it is because an item is too specific. Especially with food, it is pointless worrying about one single food item because it is total diet that matters. With the exception of certain additives, most foods are OK to eat in moderation. A mixed diet with plenty of variety is the basis of all healthy diets, but you can use information about specific foods to help you make healthier choices. There is little point doing this if you only eat the specific food once a month. However, it can be very useful to check the foods you eat several times a week. Always remember that the main concern is not a specific food and gout. Rather, it is certain nutrients. Most people are aware of the dangers of purines and gout. However, excess iron and excess calories are equally bad for gout. Some foods are almost viewed as a treatment for gout. This brings me to look at cherries. Many gout patients worry about different aspects and effects of gout and treatment in various forms. You might worry about the effectiveness of natural gout remedies, or the side effects of pharmaceutical gout treatments. Though my list looks at the concerns of all visitors to GoutPal, I am most concerned about gout and you. Do you have other health conditions that make you worry about gout and diabetes, or the effects of high blood pressure and diuretics and gout? If anything in the list worries you, please ask about it in the gout forum. I’m particularly interested if your specific concern is not in my list. Please subscribe to the free update service, to ensure you do not miss an item. What do you have to say about gout and you?